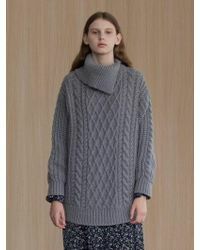 among is the Korean label that makes women's knitwear that will upgrade your day-to-day closet. The brand is known for its ultra-sophisticated and modern designs, so expect nothing less with its collection of knits. From the classic turtleneck in a selection of colours to cricket jumpers that nod to heritage style, among has styles for every occasion. There's even metallic knits that will pair with your party skirt.